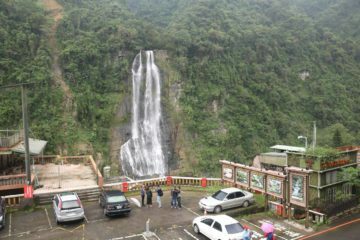 Taiwan Waterfalls (臺灣的瀑布 [Táiwān de pùbù]) seemed like pretty common features in this island republic that harbored very tall mountains and steep gorges. 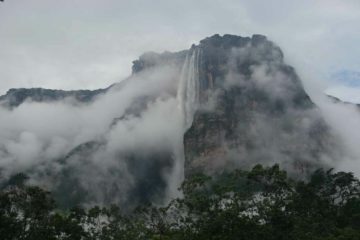 We figured that one could spend a lifetime trying to visit the various waterfalls that have already been discovered (with varying degrees of difficulty), but even just our humble sampling of the waterfalls to be found here already spanned the great diversity of what was possible. 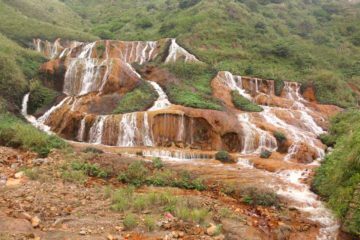 Indeed, we’ve sought out waterfalls throughout the island, and among the waterfalling highlights included the Songlong Rock Waterfall and Chinglong Waterfall in the center of the island. 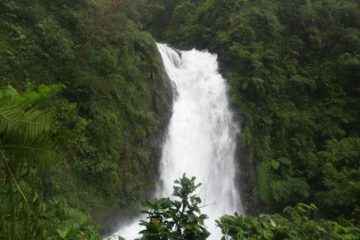 Among the waterfalling highlights in the wilder eastern side of the island were the Tiefen Waterfall and the Nanan Waterfall. 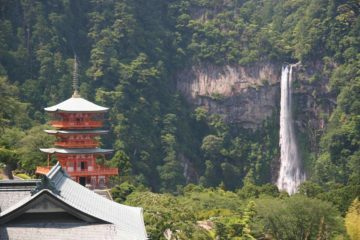 Perhaps the most famous landmark in this region was the Taroko Gorge, but it was so affected by typhoon-induced landslides that we’ll have to come back here for a more thorough visit of this world famous area. 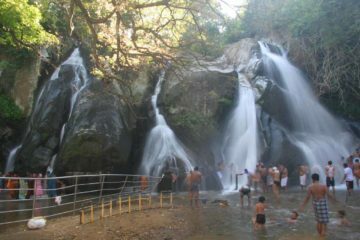 But perhaps our favorite waterfalls in the island were in the south and the north. 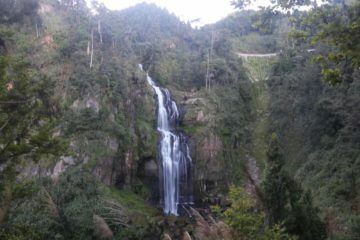 They included the popular Shifen Waterfall and Wulai Waterfall. 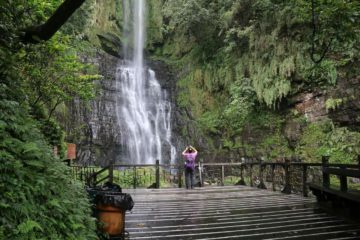 We even visited the Wufengchi Waterfall as a day trip from Taipei, the bustling metropolis that felt like quite the international destination these days. 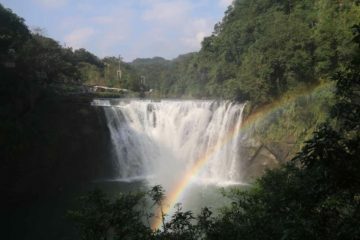 And finally in the south, we visted big waterfalls like Kayoufeng Waterfall as well as the more adventurous yet still popular Liangshan Waterfall among others. 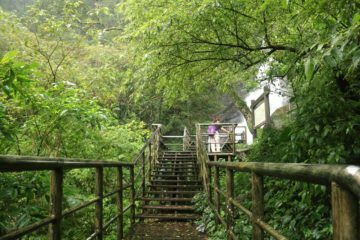 Indeed, visiting the waterfalls in Taiwan was like going back to my roots. 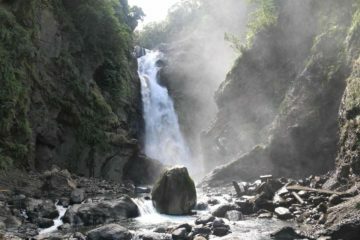 For most of my immediate relatives call this island home, but after having visited waterfalls here, Mom and I felt like we became the family experts of Taiwan simply by going a bit off the beaten path and being intrepid enough to go chase these waterfalls while seeing many of the country’s other sights along the way. Certainly going away from the cities that most of them were used to being in yielded rewards that paid us back in many intangible ways, and I’ve definitely gained a better appreciation of who I am as well as a better appreciation of the Taiwan peoples and its culture. 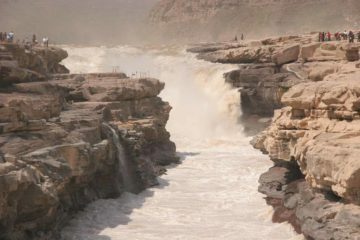 Lastly, like what I’ve done with the China region, I’ve incorporated Chinese characters in many of the waterfall names as well as other important place names. Since Taiwan uses traditional characters [fántǐzì or 繁体字] as opposed to simplified characters [jiǎntǐzì or 简体字], I’ll be using the traditional characters in this region. 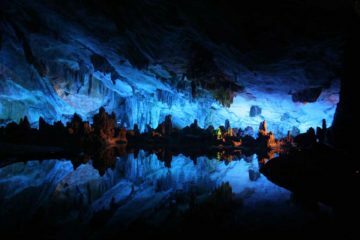 After all, more often than not, you’re probably going to find signs exclusively in traditional Chinese characters, so you’ll be better equipped at recognizing characters to keep you on the right path with such aids if you’re out trying to visit these places on your own. In addition to the Chinese characters, I’ve also provided pronunciation aids using the pinyin system [pīnyīn or 拼音], which originated in China. While some Taiwanese purists may think this is blasphemy, I’ve learned that the Taiwanese Romanizations of Chinese were pretty confusing and inaccurate (e.g. Taipei as opposed to Táiběi was one such bastardization of the language, and don’t even get me started on “Sun Link Sea” or Shanlinhsi instead of Shānlínxī). 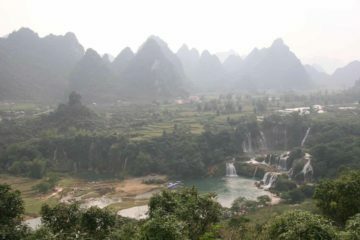 At least with the pinyin Romanization, you’ll have a better shot at being understood if you’re trying to ask for directions or verbalize some of the names of these waterfalls (especially if you understand the tones).